We are providing call center systems as a rented service over the internet. Telephony infrastructure is based on low cost Tier 1 telephony carrier and Internet Service Provider in Japan. On the call center side users must be equipped with PCs, have internet browser installed, access to the internet, IP-Phones or Soft Phones, headsets. Cloud payment model is monthly license fee per user for the required number of users, plus initial set up fee. Internet connection fee and telephony set up is not included in Klik Cloud offer but we can assist in all necessary arrangements. All applications provided are browser based and multilingual. Operators and supervisors in Japan will use all applications in Japanese while the managers from overseas can watch the performance, real time and historical reports in English. 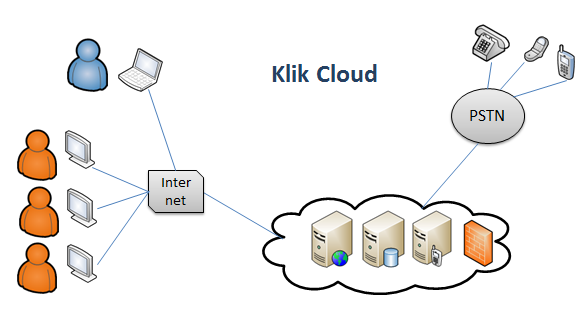 Klik Cloud is using VoIP telephony provided by KVH, a Tier 1 telephony carrier in Japan. With its reliable, high quality and low cost Voice Line service Klik Cloud customers may save 50% - 80% of the telephony cost comparing to traditional services. Voice quality is very high due to delivery over KVH’s self-healing fiber network and high quality interconnections with other carriers. 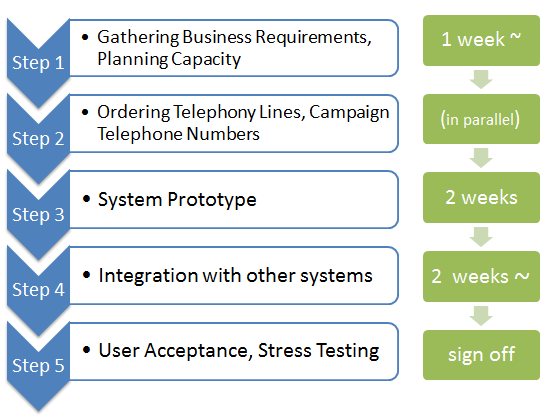 Although each call center client and even each call center campaign may have its own requirements getting the system ready to support the operations takes from 2 to six weeks. 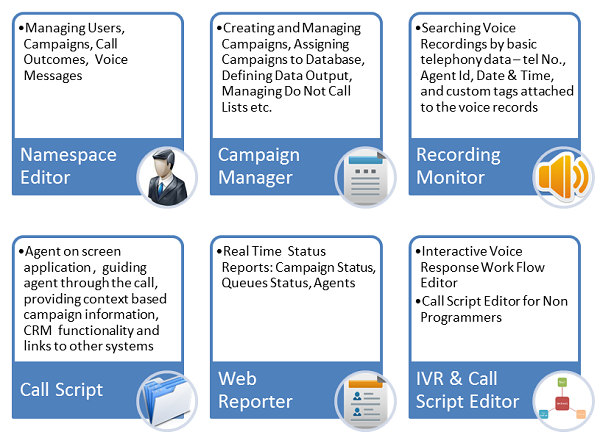 As call centers campaigns may be run to deliver completely different business results (one campaign may be for taking orders from consumers interested in buying health products, another campaign may be calling out to the customers to announce to them their insurance claim has been processed), there is a need to implement call center systems so they can be adjusted to the business related to the campaign. Klik Cloud provides the tools for the users to edit agent's user interface. 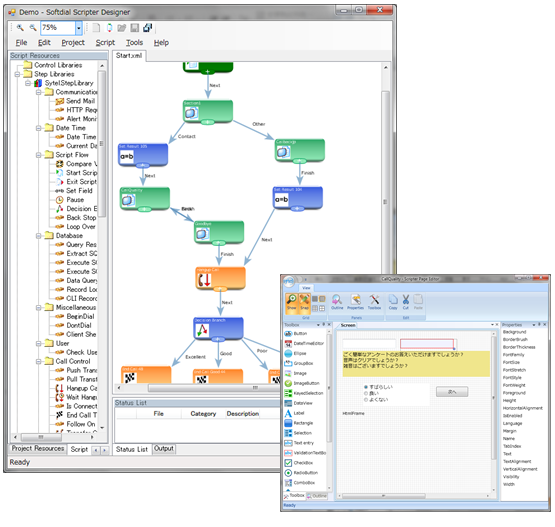 In Call Script Designer users can create call script workflow, design the screens, data exchange with the database or other systems, interaction with telephony. 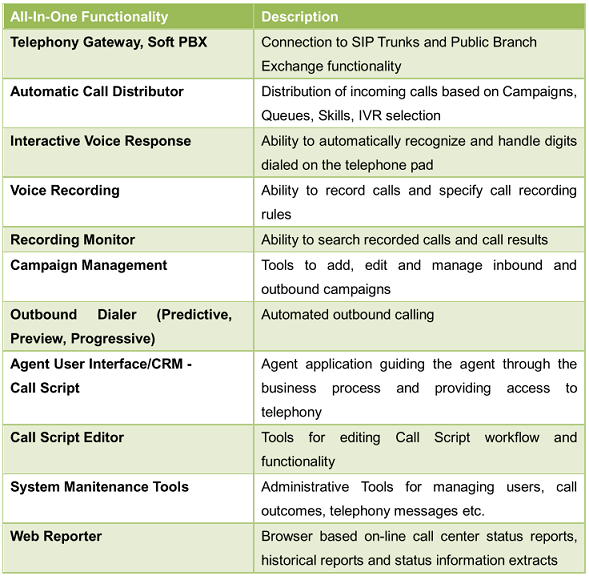 The same editing tools can be used to design the behavior of Interactive Voice Response. Copyright © KlikDotSystems 2011. All Rights Reserved.